Have you seen the new Star Wars movie yet? We saw it over the Holidays and although I am not a huge Star Wars fan, I enjoyed it. My husband and boys on the other hand are huge fans and have been for years. I thought it would be fun to create some fun Star Wars Valentine’s to share with you. I love to doodle and draw, so it is always a challenge for me to see if I can translate to paper what I can see in my mind. 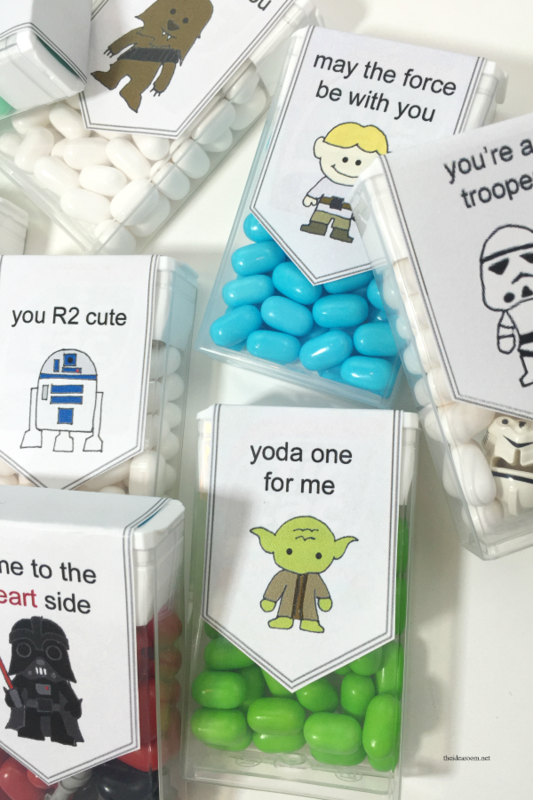 I drew these Star Wars Characters and created these simple Valentine’s that can be used on a package of Tic Tacs. I have actually had these sitting here for a while now, but the sun has been hiding for over a week. It barely peeked out enough for me to snap some pictures. Although not great, enough to get these up and ready for you to use! I have a couple of different versions heading your way in the next few days, so be sure to stay tuned for those! If you would like to print these out, simply click on the links below. *As always, these printables on The Idea Room are for your personal use only. Please do not redistribute, share or sale these. This is my original work. Thank You! If you enjoyed this post, I would love for you to pin it! Thanks! Those are adorable, you are so clever. Thank you for allowing us to use them for personal use. Question…may I give them as gifts? Yes, you can give them as gifts. Enjoy! How do i print them off i want to make for family? Just go down mid page to find the link to the printables. What are these printed on? I would love to give these to my son’s classmates vs the traditional Valentines. Thank you! I downloaded the images and used my Silhouette Cameo to cut each one out. I used sticky photo paper, which gives the labels a more high end look. They turned out so darn cute. Thanks again for such a clever and cute idea. So glad you love it. THanks. I just printed on computer paper. Enjoy! I see that you printed them on computer/regular paper, but how do you apply them to the Tic Tac containers? THANKS!! These are going to my Grandsons for Valentine’s since they are huge Star Wars fans! I just use and Elmer’s Glue Stick. Enjoy. Thanks. Can you sell these on etsy or something?? I am overseas but would love to have one or more of these sent to friends in California. If you could mail with a gift note I’d be happy to pay for it! I don’t sell them. Sorry. But they are really easy to make. Hi Nicole, Not sure if you will see this, but I am going to make some for my grandkids this week and would be happy to make some for you too! Although I am a different nicole, where are you located? I would like some also! Thank you for these. Greatly appreciated. My Granddaughter and her Father will love these. LOL funny! Wonderful Valentine’s give-aways! I LOVE these Amy!! So clever! Thank you so much. These are too cute. I am making goody bags for my US Navy son and his friends. I am sure these will just brighten their day! That is so great! Glad you are enjoying them! My daughter is at that age where Valentines are soooo babyish, but she still wants to give something. She loves tic tacs and knows that everyone else loves Star Wars – what a win/win. She and I will be printing these this weekend and making them for her class (and my class as well). So glad these will work. Thanks! Totally pinned it. These are adorable and thank you for all the work that went into these. I love the idea, but have not much of a creative streak myself. My grandson loved these and we made them for his classmates for the Valentine party they have. Also my daughter who is a teacher wanted a set for her staff. Thank you for sharing this with us, you are so talented. I love these! Thank you so much for sharing! These are so dang cute! I am wondering where you found the tic tacs with words printed on them? You apply the printable right over the top of the Tic Tac Label. Thanks. I think she was referring to the actual tic tacs that had words printed on some of them. Not on the container. Sorry, I got those in the Valentine’s Day aisle at our local grocery store. You may be able to find them at Walmart or Target down the same aisle. Thanks. These are so so cute!!! My son will love his valentines treats to give away this year!! Thanks so much!! Thank you for sharing!! These are so cute! My husband and son are HUGE Star Wars fans. I can’t wait to make some for them. Where do you buy your Tic Tac’s from? You can get them at any local grocery store or convenience store. Thank You! These are ADORABLE! My son is going to flip! These are so cute! Thank you for sharing your adorable idea with everyone! do you just place the star wars label over the existing label? Yes, that is what I did. Thanks. Fabulous drawing design & super thanks for sharing. Thank you so much! How talented you are! I’m making them for my son’s high school friends! Are there little figurines inside the Darth one and Stormtrooper one? Where did those come from? Yes. They are just some of my son’s Lego mini-figure helmets. I thought it would be cute to put them in there. Curious if you are working on some with the new characters? Rey, Finn, Kylo? Possibly, I will let you know if I do. Thank you so much! These are wonderful! I would like to print these out as bookmarks to give to our students in our elementary library. Would that be ok? Thanks so much! Yes, that would be just fine. Enjoy! These are awesome!! Just printed for my sons class and thinking of using them with lollipops. Thanks for such a great idea and the free printouts!! So glad you found them useful! Thank You! Thank you so much for making these and sharing them for free! My girls are so excited to hand these out to their friends on Valentine’s Day! So glad you like them. Thanks so much! Thank you for sharing! Would it be possible to provide a template where they could print out white on the paper? It prints the label gray and not white. I’m unable to change it on my end. I love this idea, definitely going to use it for my 2nd grader. Thanks! These are so adorable! I truly respect your creativity and appreciate sharing your printable template with mom such as myself who aren’t blessed with your gift! These are awesome! Thank you so much for sharing! You are making lots of kids/parents excited for Valentine’s Day! These are amazing! Thank you for sharing your talented artistry with us. Perfect for my Star Wars obsessed son! Would you entertain the idea of adding Force Awakens characters? To answer another comment: I found 12 packs of white tictacs at Costco for $9, or 4 packs at Target for $4. These are awesome! I had a question – I only have a black/white printer, do you have these files in a clip art or line drawing format so we can color them in ourselves with markers? Thank you so much!! You are a doll! Thank you so much for sharing your time and talent with us!!! Our family appreciates your generosity!!! So Cute! Is it possible to print this a little bigger to fit on conversation heart boxes? Love these! Would love to see some more characters from The Force Awakens, too: BB-8, Rey, Finn….. So glad you like them. Thanks. These are fabulous! Outstanding job!! 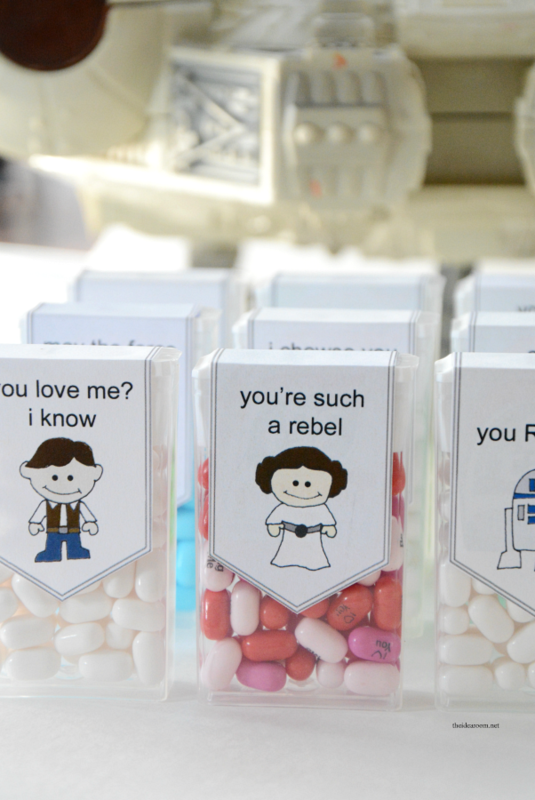 If at all possible i would like to use these for my wedding i know they are Valentines themed but my wedding is star wars and they are so cute. You are welcome to use them. Thank you! Are they still available to download? I clicked on the PDF yesterday and it worked, but today it doesn’t. Thanks so much!! Yes, they should be. Let me know if you still can’t access them. I will email them to you. I saved it down and it worked that way. Thank you so much! I’d be lost without the creativity and generosity of people like YOU! WOW! Thank you so much for making these available. FOR FREE! My son loves these and we put them on Chicklets packs of gum from the dollar store. Easy! I printed them on full sticker sheets and it took us a few minutes. Sharing pics of ours on my facebook and insta with links to you! I really appreciate it, THANK YOU! Thank You for sharing! Glad they were easy to make! I am having trouble printing these out. All I get is a black screen. 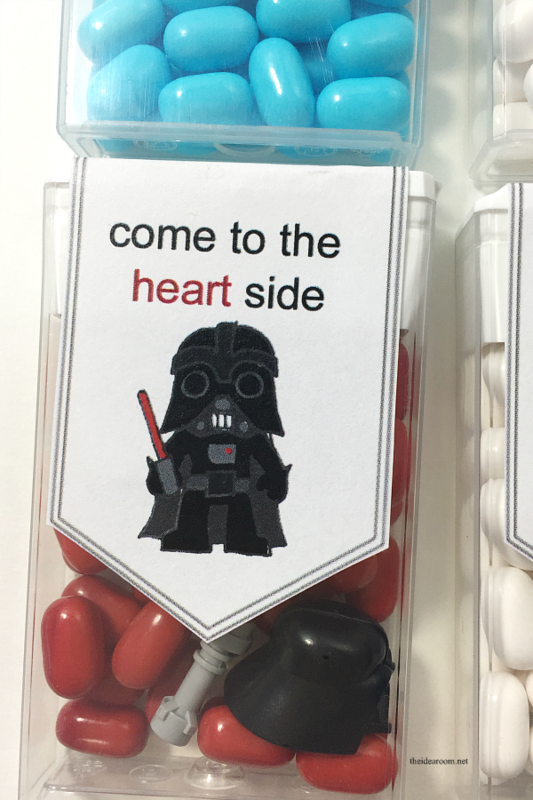 I can print out the storm troopers but not all of the tic tac printables. Could you emai; them to me. Just emailed them to you. Thanks. Love these—thanks for the free printable! Thank you so much for sharing these with us! They are cute and easy to put together. I really appreciate having a quick craft I can do without a lot of fuss. Bless your generous, creative heart! I don’t have a creative bone in my body, and I’m really grateful for people like you that share their talents so my kids can pick out Valentines that they are excited to give out. Thank you, thank you!!! These are awesome, but they won’t open for me! Could you email them to me also? Thanks!! Absolutely love these! I just had a few questions, are these labels made for the 29g Tic Tac boxes? My second question is, how did you remove the original label? They are for the smaller tic tac boxes. Also, I did not remove the labels. I just glued the printable over the top of the labels. Hope this helps. Thanks. Where did you buy the tic tacos at with the darth vador and storm trooper inside them? I believe they were a special edition. LOL! Wish I had time. Sorry! Where did you order the mint tic tacos from? You can get them at any grocery store or gas station. These star wars tic tacs are a special edition. These are so cute! Is there any way I could print them to go on a circle sticker? My boys are giving bubble tape for Valentines and I’d love to use these. I love these. I can’t wait to use them. Thanks for allowing us to use. Very cute. I had a question thou. 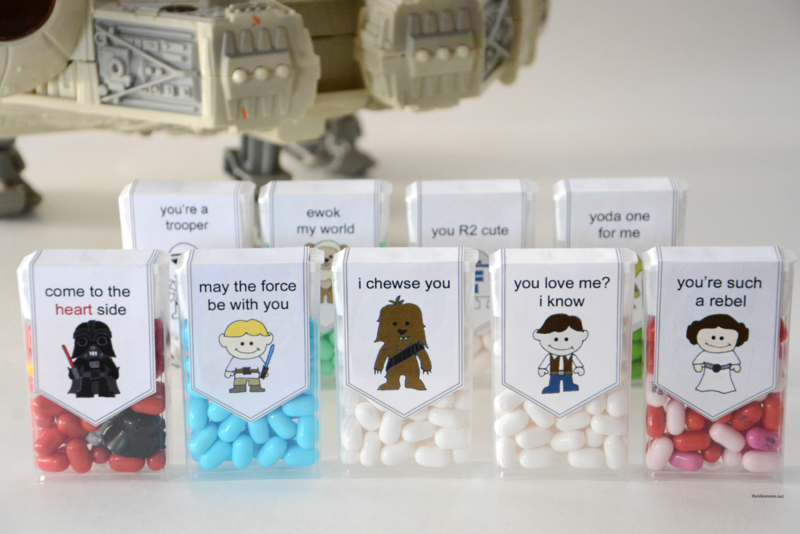 Where did you get the tic tacs with the Star Wars characters inside or did you add that yourself? If you happen to add them yourself can you tell where I may purchase. Such a cute idea. Also the tic tacs with writing on them. Did you custom order them? I noticed the one with princess Leah has it. i only see the two downloads- but not ever one is in those files- i.e. chewie, princess L, etc. is there another set of downloads i am missing? Where did you get the assorted tic tacs at? And how do the printable work? Do you tape them on? Thank you! Love these… My girls are so excited to make these for Valentine’s Day! I appreciate you Sharing them for free & making them so easy to download! 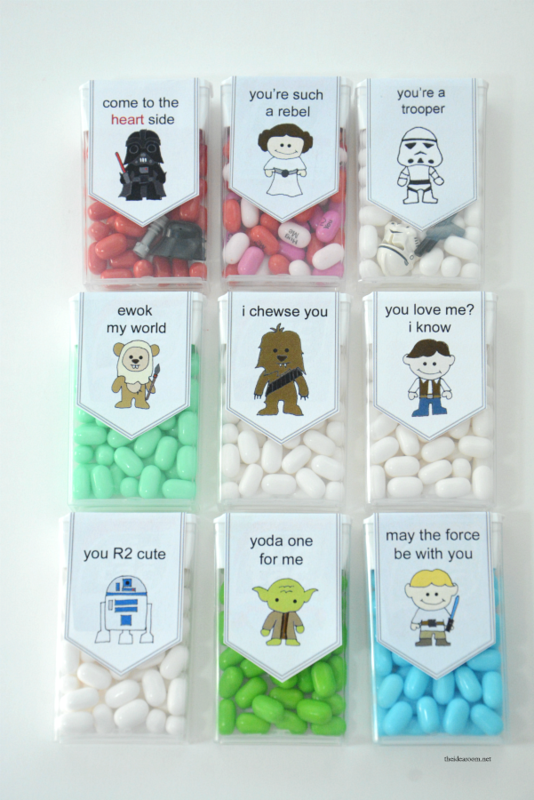 Hi…The Star wars valentine tic tac drawings are adorable!! I have clicked the links above for star wars printables but nothing is happening. What am I doing worng?? Hello, I was wondering if these are just pasted on the little 1ounce tic tac containers? Hello, I was wondering if you just pasted these on the regular 1ounce package of tic tacs? Thanks! I would LOVE to make these with my daughter for her class my I use your design? Heather Yes, please do use them! These are AMAZING and soooo CUTE! Thank you and bless your heart for offering these to your fans for free! Corinna- Thank you for following along! I will see if I can add more. Thanks for following along! You are amazing and these are just the cutest. Thank you so much for sharing this with us and allowing us to use them. My boyfriend will love theses! Megan- So happy that you are able to use these. Happy Valentine’s Day! Peggy- You are funny! Thank you so much! Amanda- Let me check into it.